HBO isn't afraid to take some risks and do some pretty weird things in terms of original programming, and this totally proves it. Their upcoming original movie, My Dinner With Hervé, is going to center on Hervé Villechaize, once the most famous dwarf in the world, as played by Peter Dinklage, who is arguably the most famous dwarf in the world now. HBO has released the first photo from My Dinner With Hervé, and it looks appropriately strange. The premium cable network released the image from My Dinner with Herve today, giving us our first look at the Game of Thrones star as Hervé Villechaize. The image also features Fifty Shades of Grey star Jamie Dornan hanging out in a white car, which looks like it could be filled with cocaine. 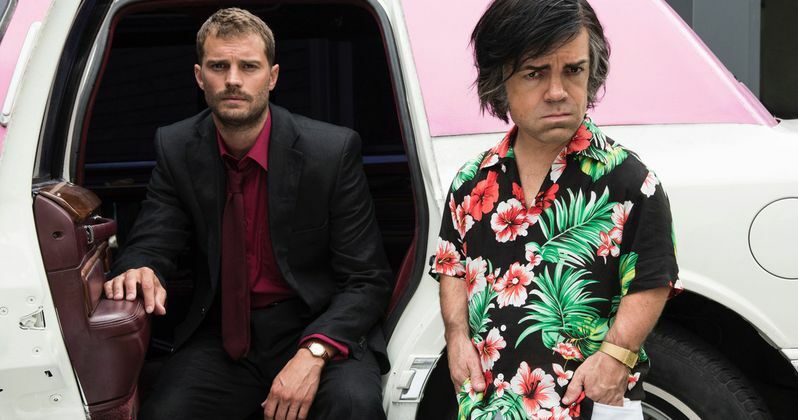 In truth, with Peter Dinklage's get up, which is appropriately flashy in a very 90s way, one would think this movie might be about an unlikely undercover cop duo who are trying to bust cocaine dealers in Miami, or something along those lines. But, as reported by Deadline, that is far from the case. Here is how they are describing the plot of My Dinner With Hervé. "Written by Gervasi based on a story by him and Sean Macaulay and directed by Gervasi, My Dinner With Hervé centers on an unlikely friendship that evolves over one wild night in LA between a struggling journalist and actor Hervé Villechaize, the world's most famous gun-toting dwarf, resulting in life-changing consequences for both." So yeah, this is a pretty odd movie to be happening at all, but Peter Dinklage is pretty beloved and tends to disappear into a role. Maybe that will help compensate for the fact that, despite the attention to detail on HBO's part with the outfit and the hair/makeup, Dinklage looks nothing like Hervé Villechaize. Sacha Gervasi (The Terminal) has his work cut out for him it sounds like. Weird or not, this may wind up being a must watch when it arrives, just out of pure curiosity. My Dinner With Hervé is still in production, though, so that may be a while from now. In case you aren't familiar, Hervé Villechaize was a very famous French actor throughout the 70s and 80s. He is probably best known for his work on the TV series Fantasy Island as Tattoo. However, James Bond fans will probably recognize him as Nick Nack, who worked for Christopher Lee's villain Scaramanga in the Roger Moore classic The Man With the Golden Gun. Villechaize passed away in 1993 and, based on Deadline's report, it sounds like this movie is going to take place during the year he died, which adds another layer of interest to this bizarre movie. If the first image is this intriguing, we can only assume the trailer is going to be even more strange, but hopefully in a good way. For now, you can check out the first image from My Dinner With Hervé for yourself below.